There’s a lot you know about the Venus Williams on the court — her unwavering focus, powerful athleticism and splashy outfits. All of which have helped her earn four gold medals and 49 singles titles, including seven Grand Slam singles titles from Wimbledon to the US Open. When she's not working as one of the best tennis players on the planet, she runs two successful businesses, including an athletic apparel line and an interior design firm. Yet you may be surprised to learn that Venus is a rather soft-spoken jokester. And for a woman who's such a fierce competitor, Venus makes life decisions quite mindfully, choosing to only pursue things that make her feel joyful. Did you know she follows a plant-based diet? LIVESTRONG.COM got a chance to talk to Venus about her role as a brand ambassador for Silk, helping encourage everyone to #DoPlants. Though her diet is plant-based, she appreciates that Silk products allow people to easily swap animal byproducts for plants, customizing a diet. "It’s just finding something that works for you," she told us. LIVESTRONG.COM: Tell us about what you eat. Why do you choose to eat a plant-based diet? Have you noticed a difference since becoming vegan? 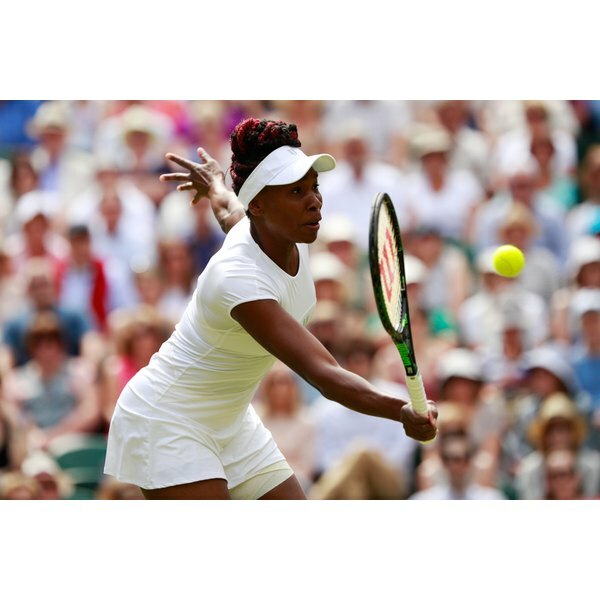 Venus Williams: I started a plant-based diet for health reasons. I wanted to be as healthy as I could and be able to be at my best for tennis. I think there’s a very big difference. I feel more energetic and also, as a byproduct, [I have] great skin. It worked for me and that’s why I stuck to it. LS: What are some of your go-to favorite healthy snacks? VW: Definitely my favorites are kale chips — but ones that taste good! And dried cherries. Those are my two favorites, for sure. LS: What is your favorite game-day meal before you have a big match? VW: Before my matches I love either fried rice and/or baked potatoes or sweet potatoes. I pretty much want to eat them every time. LS: Those sound delicious. I would love to eat fried rice before a workout. VW: You can’t run out of energy out there so I typically eat a lot when I’m playing tournaments, and then I tend to take a break from eating when I’m not playing tournaments because eating is such a full-time job. LS: How wonderful to think of eating as a full-time job. Which brings me to my next question, how does food play a role in your health and happiness? VW: I don’t like to eat food that doesn’t taste good, no matter how good it is for you. You have to still be happy and food makes us happy, so, find your happy place whatever you’re eating… just as long as you’re adding plants to your diet. LS: Eat to be happy. I love that! Do you have a vice? Or shall we call it a “healthy indulgence”? VW: I love fried foods, and I always say, ‘French fries are vegan.’ They’re my favorite vegan food. I have definitely maybe overindulged in that in the past. We all have things we’re working on. LS: What are your top consistent healthy habits that have made the biggest impact on your health and happiness? VW: Just always including plants [in her diet]. I find one of the easiest ways to include lots of them is the smoothie. I always add something green in my smoothies even if it’s, like, a pineapple kale smoothie. I add cucumbers or kale or spinach or whatever it is. Besides the plants, eating the right sugars, cutting out simple sugars and eating sugars that are more naturally occurring. Sleep is important, I think, for everyone just to be restored. That’s definitely a good one. LS: What are some things that you do for self-care and mental wellness? VW: For mental wellness, I try to only do things that I know that I can achieve. So if I agree to something, like give my word, I keep it. I don’t agree to do things that I feel will make me unhappy or I don’t think that I can actually achieve, so that’s super important for me. I try to do things that I love and incorporate that into my life. LS: That’s a very inspiring answer. And it’s so simple when you think about it. So what are you like off the court? How would you describe yourself? VW: Well, I’m not very serious. I joke a lot, that’s pretty much all I do all day. I’m the person in the background with the one-liners. That’s me, I’m just kind of a jokester. LS: How do you experience and deal with performance anxiety? What are some tools that you use to keep calm? VW: There’s always pressure. It’s just about dealing with it. If you’re going to do something that you enjoy then yeah there’s pressure — but you’re ready to beat it. If you don’t enjoy it as much, then the pressure’s going to be too unmanageable because you don’t enjoy what you do. The motivation of wanting to be there and excel at something you love makes [for] less pressure. Also, I always try not to worry about something, especially if I can’t do anything about it. I’ll go to the ends of the earth to do something, but if I can’t do more, I’m also not going to worry about it because I’ve done everything. And third, I think pressure is a privilege. It’s a privilege to be in a pressured position because that means you get a chance to do something great. LS: It’s like thinking of anxiety as another feeling for excitement. Like it’s a good thing. VW: Yeah, you have to show up, so why not compete? LS: What are your fitness or career goals and your overall focus over the next year? What are you hoping to achieve? VW: Well, my team has a really funny joke. My sparring partner is extremely fit. He has ripped abs! So last year, at the Australian open, randomly, we were all watching the match and he was voted "best body" of the tournament! We always say we’re taking the title next year, and the next year goes around and none of us are quite ready. So my goal is that next year I’ll take the title. LS: That would be awesome. If there’s a message that you want to get out to people today what would that be? VW: I would always say to eat what you love and to incorporate more vegetables and fruits and fresh things in your diet — a diet of fresh ingredients. And have fun too. LS: Excellent advice. Well, I really hope you take the title next year for best abs. VW: I’m going to start doing some sit-ups after our call. Did you learn any new surprising information about your girl Venus? How do you make sure to incorporate plants into your diet? How do you deal with "game time" pressure?